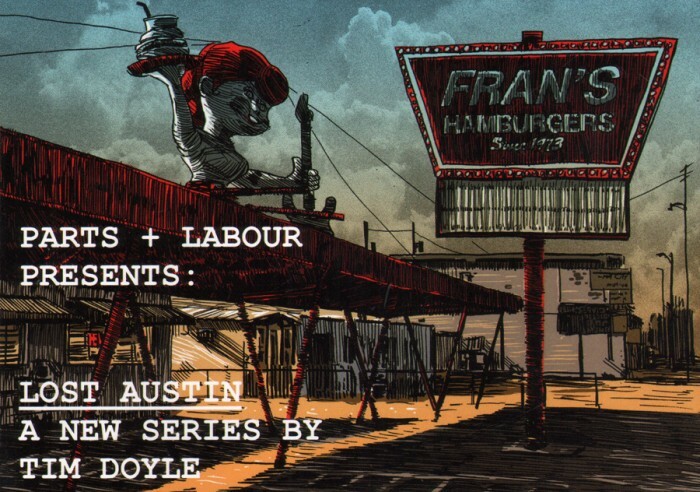 Tim Doyle’s “LOST AUSTIN” art reception 10/22 in Austin! LOST AUSTIN OPENING RECEPTION PARTY AT PARTS AND LABOUR! Long-Time Austinite Tim Doyle turns his artistic eye to his adopted home-town, and the landmarks of Austin that have slipped into memory. LOST AUSTIN is a new series of illustrated serigraphs, celebrating the Austin that was. “The Austin Chronicle-Best of Austin” winning artist for 5 years running, Tim Doyle has a worldwide fan base of collectors for his series of pop-culture art-prints, and he is very pleased to finally honor the city that birthed his artistic career. These signed and numbered, limited edition prints will be available for sale exclusively at Parts and Labour (and at www.partsandlabourstore.com beginning Friday, October 23rd at 10am). An opening reception will take place Thursday, October 22nd from 6-9 pm at Parts & Labour located at 1117 South Congress Avenue Austin, Texas 78704. This event is free and open to the public. Reminisce about “the good ‘ole days” over snacks and cocktails with our compliments. Parts and Labour has been home to Texas designers since 2004. All items for sale are designed and produced by hardworking, Texas based small businesses. We are honored to host this event, and cannot wait to share this series with everyone! ← Two Wes Anderson Inspired prints- Available NOW!